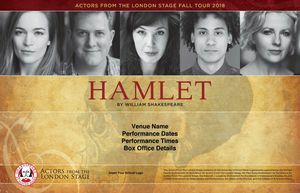 Actors From the London Stage Return to Perform "Hamlet"
Actors From The London Stage, now housed at the University of Notre Dame, is an educational and theatrical program that brings a troupe of five classically trained actors from major English theatres to college campuses for week-long residencies. During their week at the University of Texas, the actors teach approximately 30 classes and workshops and perform minimalist productions of a full-length Shakespeare play – three times at UT and once at Winedale. Actors From The London Stage at the University of Texas at Austin is sponsored by the College of Liberal Arts and the Department of English. The full-length plays with five actors playing all the parts are minimalist in terms of props and staging, intimate and compelling. Performances of Hamlet will be held at the Bates Recital Hall (inside the Music Building) on UT Campus, Wednesday, September 19, through Friday, September 21, and at the Winedale Theatre Barn (near Round Top, Texas) Saturday, September 22. Click here for ticket information.